“It is not incumbent upon you to complete the work, but neither are you at liberty to desist from it.” –Rabbi Tarfon. Other Places, Other Things . . .
We had snow the other day . . .
Look at my lovely new roof . . .
Something pretty for Monday morning . . .
My chicken house is clean. Mostly pins, with some other oddments. 8.5" x 11", approximately, quilts to explore various ideas. 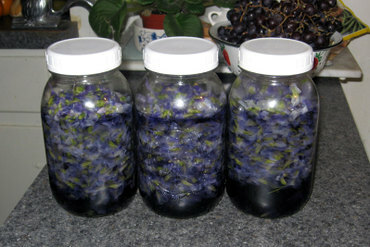 We have a side yard full of violets every spring, and every spring we make violet jelly to sell at the tailgate. People always ask what it tastes like . . . it's difficult to describe. Sweet, but not too sweet. Crisp. It tastes purple. It tastes like spring, the same way rhubarb (and ramps, if you're from up here) taste like spring. No matter what time of year I eat it, it reminds me of those spring days when things are just leafing out and there's a haze of green over everything, the sky is such a bright clear blue it doesn't seem quite real, and the whole world is full of birdsong. 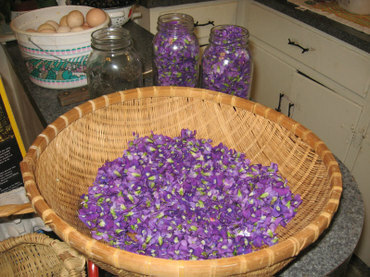 So last week I spent two hours in the yard picking violet blossoms. It's not quick work; the basket and two jars full below are my afternoon's haul. But it's pleasant work: the cats always help, the birds sing, and this time I saw a nearly unbelievable sight: tiny praying mantises, just hatched, only half an inch long at most, and nearly translucent. If I'd not been down on the ground I'd have missed them! This is what you do with them afterward: stuff them into jars. I use quarts because I have some, but anything will do. This is after fifteen minutes or so . . . the hot water leaches all the color out of the petals (and all the Vitamin C, too, which is considerable). Then you let them sit for 24 hours or thereabouts. Pour them through a strainer into something wide-mouthed. (The voice of experience speaks here: do not attempt to pour the infusion through the strainer directly into another jar. It makes a mess. Trust me.) 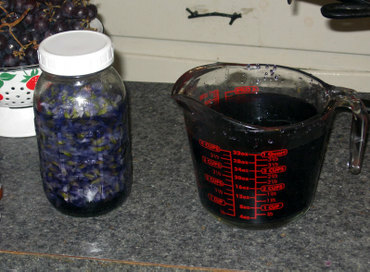 You will have a lovely violet-colored infusion which can be made into jelly or syrup, or frozen for use later. (That's where mine is, since I got sick before I had a chance to do anything with it.). 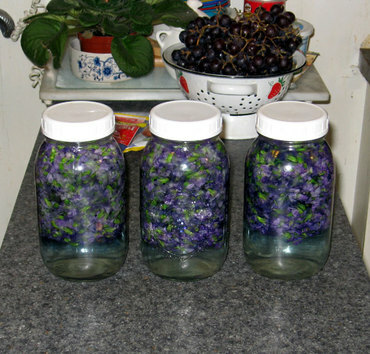 I usually get a couple of cups from a quart jar full of violets. For those interested: the jelly recipe calls for 2 cups of infusion, juice of one lemon, a package of pectin, and 4 cups of sugar. Make in the usual jelly fashion . . . if you've never made jelly, invest in a copy of the Ball book. (Ball as in Ball canning jars, which aren't made by Ball anymore, but by Altrista . . . ) I can't remember what it's called (and of course mine is somewhere else), but you can get it with the canning supplies. If I remember right, it's $10 or less and will tell you everything you need to know about preserving stuff, and it's full of good recipes. A final bit of interesting information: the British used to (and may still, for all I know) use violet syrup to flavor medicines. Ooooooo....sounds nice. I remember Violet candy or gum. Or was it lavender? Now I have to try and find it! Well Anita, I must say I have never even heard of this before. But it sound pretty darn interesting. So .... are these just regular growing Violets, or do you grow them from special seeds? YUM! I LOVE rose hip jelly, so I KNOW I'd love violet! People tell me I'm strange. I say, "No, I'm open to new tastes!" (I also love habanero jam on meat. Delicious! And pumpkin butter or apple butter on pancakes.) I do not have access to violets, but I'll go look for some violet jelly in Whole Foods Market! Oh, thats delightful. Thanks for sharing that with us. 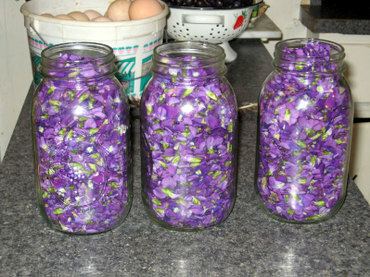 This is Freakin Awesome Wow I have heard if it but never saw it..
That's a lot of violets. I don't think spring will ever make it here!! Do violets have a diuretic effect? do you candy the flowers too? I love the violet jelly process!! We had violets at our house, and I loved them, they are my 88 year old mother's favorite flower! She would love this! We are in an apartment now, and no violets :(, but I shall remember this if I ever have a garden again. I love your blog, and Eliza sounds like a girl after my own heart. I am so glad that you posted that, I love to read about children like her!